How are these small boats made? The pictures below show the wooden pattern produced from solid wood and hard rubber from the CAD (computer Aided design) file for the product. 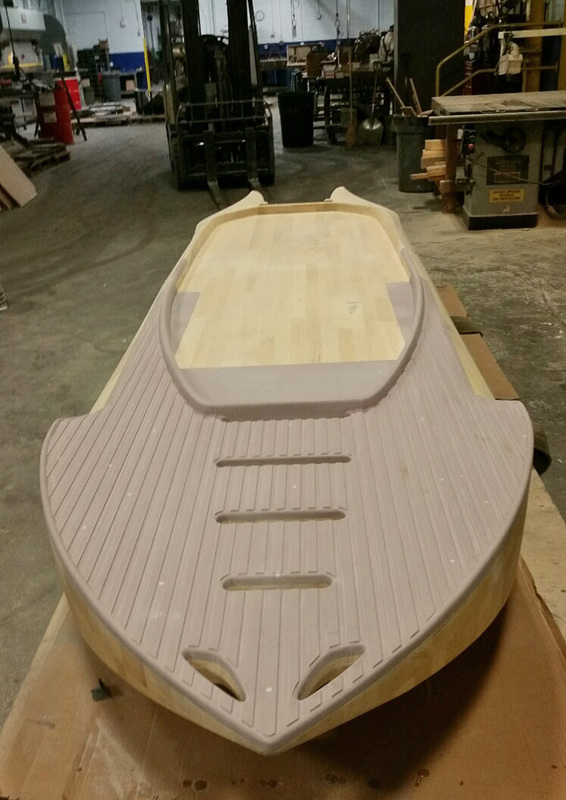 This first-generation mold will be used to produce a second generation mold called a sand mold. 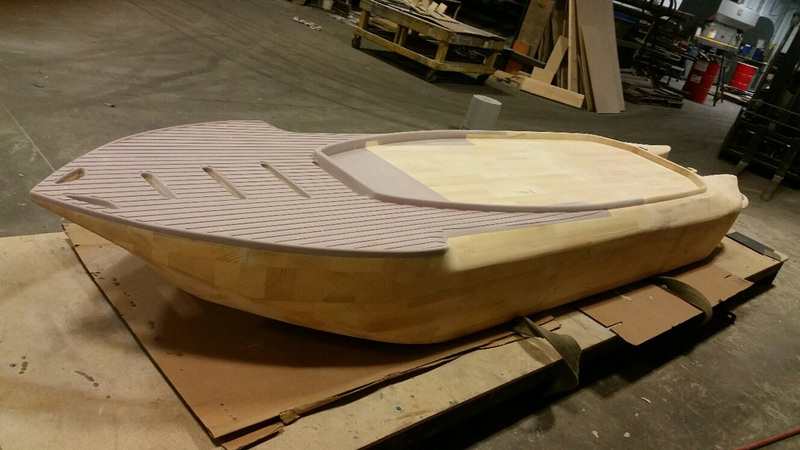 The mold makers will cast molten aluminum into the sand mold, and produce the actual rotational mold in which molders will pour Polyethylene resin, and produce the Series 4 boats. The cockpit features slanted sides designed to allow the passengers to paddle this boat effectively with either canoe or kayak paddles. Paddling capability is critical to mobility and high performance in shallow water and weed infested water. This design makes poling easier as well as more effective. The stand up casting platform is supported by integrated structural beams that look like slots when viewed from the top. 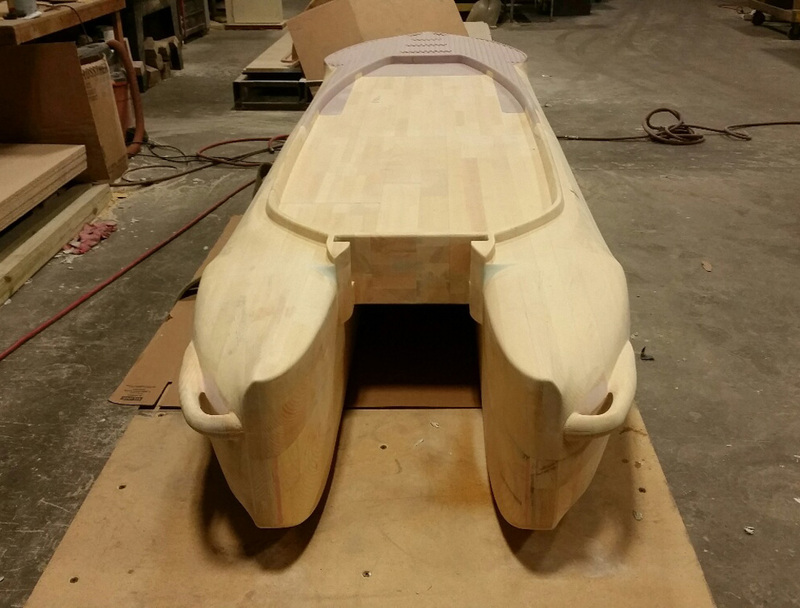 Front view that shows the S4 two hulls, which make it a full catamaran. The stand up casting platform at the front – a typical skiff feature. This platform is particularly appreciated in flats fishing, by fly anglers and other fishers who practice sight fishing. Rear view with the integrated transom motor mount. Side view of this ultralight portable skiff. 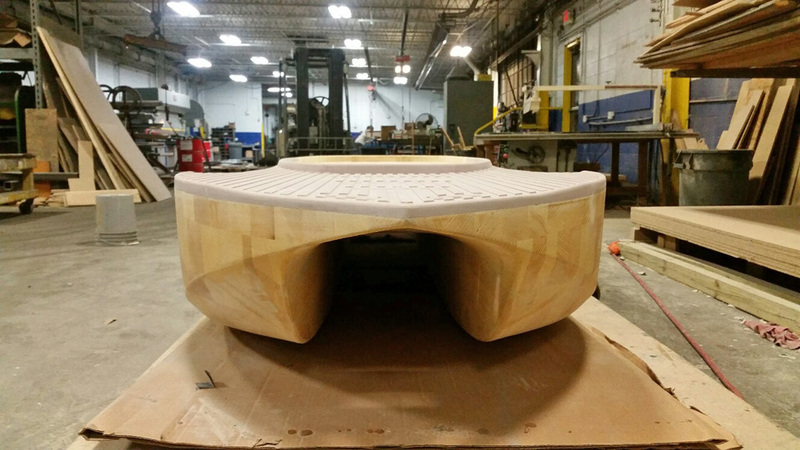 Bottom view of the pattern for this boat. Wavewalk announced the new Series 4 (S4) of portable boats (car-top boats) that are extremely stable even by comparison to larger boats that require transportation by trailer. 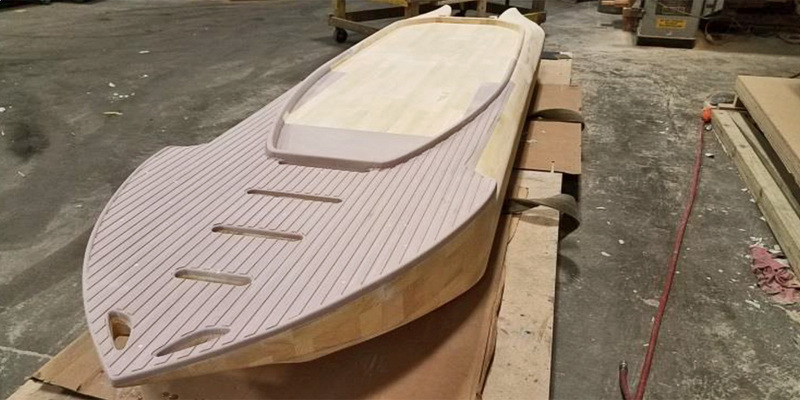 Still, the 38″ wide S4, which feature slated cockpit sides designed to facilitate paddling, will work well enough as paddle craft, namely for kayaking, canoeing, and kayak fishing. In this case, portability also means gaining extra mobility through the option to launch anywhere, and the option to paddle effectively means being able to go in shallow water where motorized fishing boats are prevented from going, as well as in weeds, and no-motor zones (NMZ). The ultralight skiff (98 lbs) is by no means limited to being a solo skiff, and with a load capacity of over 600 lbs it can take two big and heavy anglers on board, or three lighter persons, plenty of fishing gear and camping gear, and a powerful outboard motor of up to 6 HP. 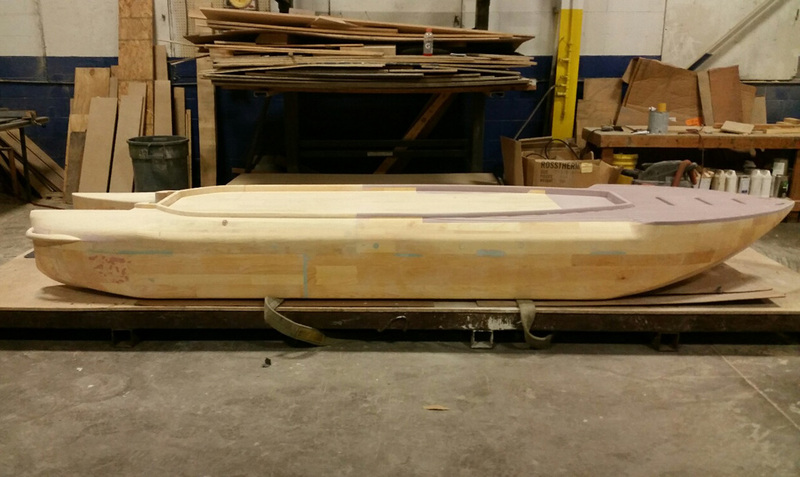 This will be the first skiff from Wavewalk to feature a traditional stand up casting platform at the bow. This will make the boat perfectly adapted to fishing the flats with a crew of two, and still, its extreme stability and twin-hull (catamaran) design guarantee offshore capabilities beyond what is expected from small skiffs and Jon boats. This hydrodynamic advantage, which pertains to tracking and seaworthiness, is enhanced by the ergonomic advantage provided by the saddle seat, which is similar to seat that feature in personal watercraft (PWC), also known as jet-skis. This new, versatile skiff will be available starting in April, and it is offered at a $2,505 price point, without accessories. Before the W700 existed, there were several important differences between large size fishing kayaks and small boats. Since kayaks’ primary means of propulsion is paddling, they need to be narrow enough to allow their passengers to propel them with dual-blade paddles (‘kayak’ paddles). Boats are not supposed to be paddled but they need to be transported on trailers, which is why their width is determined mainly by the width of roads’ lanes. Being essentially narrow mono-hulls, fishing kayaks are unstable, which is why designers and manufacturers continuously attempt to push the envelope of kayak width by offering excessively wide kayaks (known as ‘barges’) that are quasi impossible and sometimes totally impossible to paddle. Typically, a monohull fishing kayak’s instability allows an angler occupying its seat to lean slightly to one side, but as soon as they lean more, they lose balance and capsize. By the same token, an extremely large monohull fishing kayak may offer an athletic fishermen to try to stand along the kayak’s center line, but as soon as they move sideways, they lose balance. 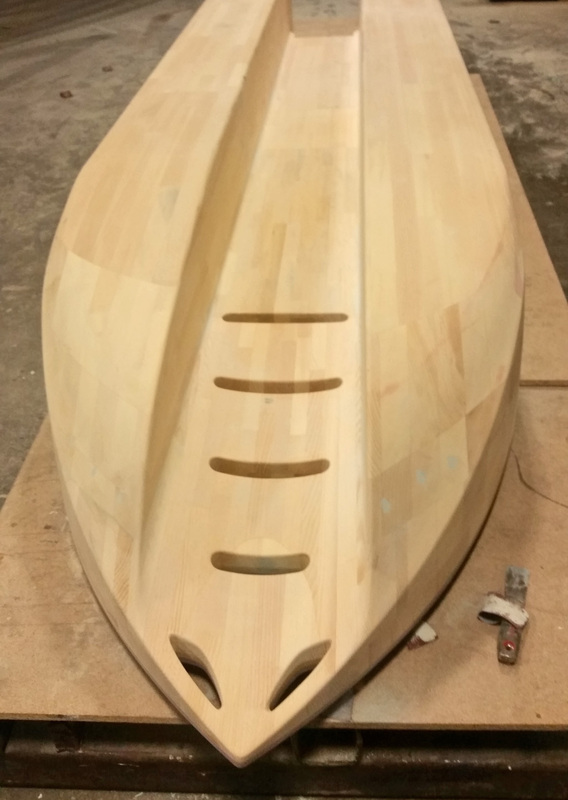 So basically, the passenger of such large mono-hull kayak is prevented from moving from one side to another, and by this fact such a fishing kayak differs from a boat, which typically offers its passengers to sit or stand on the side of their deck. The Wavewalk 700 weighs 80 lbs without accessories, and it’s 31 inches wide, which is fairly slim compared to the average fishing kayak out there, and its very skinny compared to some fishing kayaks whose width exceeds 40 inches. This makes the W700 a lightweight fishing kayak by today’s standards, and a narrow one too, by the same standards. The W700’s design is based on a patented technology that’s radically different, and this changes the rules of the game as far as stability is concerned. This puts the W700 in the category of boats, as far as stability is concerned – a true game changer, and together with its extremely good tracking capabilities, turns it into a high performance boat, or microskiff, when motorized. The ability to take a second passenger on board is a third important difference between fishing kayaks and boats: The former are typically capable of supporting a single passenger, and realistically speaking, no one fishes out of a tandem fishing kayak because neither paddling such craft nor fishing out of them is acceptable in terms of ease or comfort. In other words, these kayaks are not remotely fishable in tandem. In contrast, the typical crew size of a fishing boat, even a small one such as a Jon boat or a microskiff, is two, and this difference is critical.